OOOOOOK! So. Here we go. Your friend (a restaurant owner) calls you one afternoon in urgency. Something terrible has happened and he needs your support at once!! You borrow $50 from the neighbor's kid (as you are broke -as always-) and get a cab to his place. You see him sitting head-in-knees. "What's up brah?" You ask. "I'm ruined!" He replies. "A group of high dignitaries are coming to my restaurant and the special lamb-fried-rice I prepared for them is spiked with poison!" You wonder for a moment why a group of high dignitaries would come to a useless place as this restaurant, but * ahem ahem *. So you go on to ask "Is all the dish spiked?" "No. Only 1 plate. But demons take me, I don't know which plate it is!" "Calm down man and tell me things from the start!" You tell him. "OK here goes. A group of 16 dignitaries was coming to my place and they are all Asian. So I prepared our high specialty dish, lamb-fried-rice. Now it happens that one of my waiters was demanding me a salary increment for previous 4 months and I had been refusing him (oh you cheap skunk!). Now as a cook was passing around the kitchen area, he saw the waiter take out a small bottle from his pocket and add it to a plate (there were 16 plates on the row). He immediately went and confronted him about it, on which, that idiot jumped from the window of 3rd floor and ... died on the spot. In the meantime, other waiters had picked the plates up and left for placing them on the table. So now the idiot cook doesn't even know which plate it was that was poisoned. "We have 4 poison testing machines with us which can detect the minutest amount of poison in given sample. But all machines can work on only one sample at a time and each machines take 55 minutes for producing the result. The dignitaries are arriving in 1 hours and 15 minutes. How the demons am I supposed to find the spiked plate in this time? Aaaaaaargh! I'm ruined. Ruined! Ruined! RUINED!!" Only one plate is poisoned. There are 4 poison testing machines. Each machine can work on only one sample at a time. The result is delivered only as positive (sample contains poison) or negative (sample is not poisoned). Each machine takes 55 minutes to process the sample. The dignitaries are arriving in 1 hour and 15 minutes (75 minutes). You must find the poisoned plate within this time. P.S. If you find the poisoned plate, don't expect your friend to pay you the 50$ you borrowed to reach him. If he was such a generous man, he would have increased the salary of the poor waiter! Number each plate from $0$ to $15$. Convert each plate number into binary. Number the machines 0-3. The $i$th machine takes in all samples with digit $i=0$. Each positive sample means $0$ and the rest mean $1$. Hence you know the poisoned sample. Start with a number 15. If tester 0 is positive, subtract 8. If tester 1 is positive, subtract another 4. If tester 2 is positive, subtract another 2. If tester 3 is positive, subtract another 1. Basically, you have 2^4 plates to test, and 4 machines. This obviously hints of binary. You create a series of combinations to each plate occurs in a unique combination of testers. Based of the binary system, you make combinations so all different options are created. '0' means a plate is not included in the tester sample, '1' means it is included. The test shows that there's 16 unique tester combinations, matching the 16 different outcomes for the 4 testers. Therefor, matching the results of the 4 testers in 55 minutes, means you have 20 minutes to prepare the samples and make the correct conclusion. 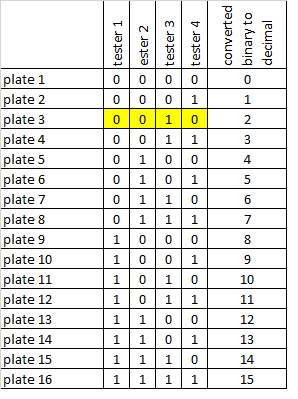 In the example above, you could see that if testers 1,2 and 4 come back negative, and tester 3 is positive, you know for certain plate 3 is the poisoned plate. then run all 4 machines at once after they are loaded up with small amounts of each sample. Once the 55 minutes are over, you can then read which testers (if any) read as containing poison and match that up to the corresponding plate. If no testers read any poison then it is plate A. follow the reverse of the table to figure out which plate is poisoned. Working backwards, we can get an answer a non-programmer might come up with. First, 75 minutes is a red herring. Since we can't do multiple rounds of testing and since the testers can't return partial results, we can't leverage the extra 20 minutes. We are done after 55. If multiple testers are positive, then the poisoned plate must be one whose rice was put into each of those testers. If no testers are positive, then the plate must be one whose rice wasn't put into any testers. Since any permutations of positive and negative results are now allowed, there are 2^4=16 ways to get results. Since there are 16 plates, we need to leverage each outcome. Outcome 1) No testers are positive. Since this situation must uniquely identify plate #1, we needed to have aside plate #1 and only plate #1. Outcome 8) The third tester is positive, others are negative. Rice from plate #8 must have been put into the third tester and only into the third tester. Outcome 16) All testers are positive. Since this situation must uniquely identify plate #16, we needed to put some rice from plate #16 into each tester. None of the other plates are in each tester. Not the answer you're looking for? Browse other questions tagged logical-deduction pattern story or ask your own question. Dear Royal Doctor, please help save the King!